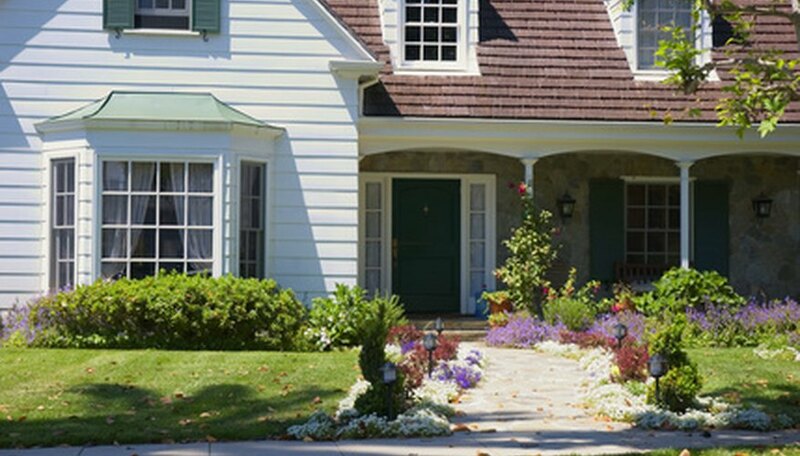 Curb appeal, that attractive first view to visitors, can start with a well-landscaped front walkway. Properly placed plants and features will direct the visitor’s eyes forward, perhaps to a turn in the walkway or to a well-lit front door. Keep scale and proportion in mind when landscaping a front walkway. Build a walkway that captures the eye. Curved or straight, build the walkway with cobblestone, flagstone, brick or concrete. If using concrete, stain the concrete and stamp a design on the surface to give it the look of brick or stone. Add a feature to a wide walkway, like a fountain, large potted plant or bench. An arbor at the beginning of the walkway (by the street or driveway) creates a doorway to your lawn and garden. Enhance the arbor with climbing flowers like clematis. Toss mulch on all soil surfaces to retain moisture for the plants and block weed growth while giving a neat appearance. Create a border to the front walkway using short flowers that may slightly overlap onto the walkway. Choose varieties and colors of flowers that complement your home and the design of the walkway, like impatiens or candytuft for a traditional setting or coreopsis or pansies for a country casual setting. Use creeping ground cover, like blue star creeper with its tiny blooms, to fill spaces between stepping stones. Ornamental grasses fit any setting and though blooms are small if at all, the color and the motion of the grasses add a soft appearance to edge of a walkway. Use tall grasses with plumy tops to border a beach house walkway. Keep shrubs low. A slow grower, like boxwood, can be pruned to a desired shape. The Knock Out variety of roses, spaced away from the edge of the walkway to avoid scratching ankles, gives flower power from spring to fall. Place fuller or taller shrubs, like an evergreen or hydrangea, on each side of the walkway near the front door to direct the visitor’s eyes to the entrance. Install a pole lamp near the street or driveway to mark the entrance to the walkway. In addition to or instead of a pole lamp, use low lights installed the length of the walkway for safety and to illuminate plantings.